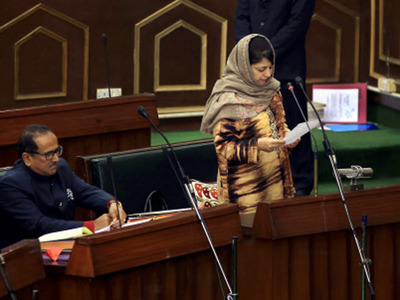 SRINAGAR: Jammu and Kashmir Chief Minister Mehbooba Mufti disclosed in the state assembly on Friday that the army had not filed any counter FIR in the Shopian firing case. “No two FIRs have been filed in the Shopian army firing case. The only FIR filed so far is the one registered by the police… and the army has given only its version but not filed a counter-FIR,” the CM informed the House. J&K police had registered an FIR on January 28 against the army, charging its 10th Garhwal unit and a Major rank officer with ‘murder’ and ‘attempt to murder’ over the killing of two youths in Kashmir’s Shopian district the previous day. Eight civilians and seven soldiers were injured in the firing. Another youth succumbed to his injuries on January 31. The CM also said that the situation is not conducive to revoke the Armed Forces Special Powers Act (AFSPA). “The situation on ground does not allow revoking AFSPA,” she said.